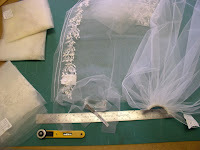 One of my sewing customers sells embroidered wedding veils. She gets the embroidery from India and needs the combs and labels attached. Folded veil fabric is on the left. I trim the top and use the extra tulle to wrap the comb. Finished veil is on the right. I had a problem with Josh's Christmas sock. I used up all the yarn. I knew that my local store had more yarn. Monday lunch time was devoted to this errand. 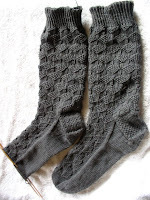 The socks are now finished. Vitor has a birthday coming up and his socks are started. 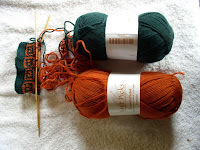 I'm not working this Thanksgiving weekend, so I'll have more knitting time. These are his favorite colors. I hear that his bedroom has been painted green and orange. We've been doing our part to boost the economy. In the last 2 weeks, we've bought a new refrigerator, a new laptop for the shop, and a new fancy serger machine. All of the above were working, but had serious problems. The serger has a broken gear, hopefully repairable, but I can't work without one. I've wanted this type of fancy machine for a long time. The refrigerator had a broken door hinge and was 20+ years old. Possibly repairable, but don't tempt fate on life expectancy. The computer works fine, but the screen is attached to the keyboard only by a couple of wires. I'll try to get some pictures soon.